This Veteran's Day, one American Flag will complete a 4,600-mile trek across the United States carried by the hands of over 10,000 veterans and civilian volunteers. As in years past, the symbolic showing is inspiring spontaneous acts of unity by aging vets along the way. 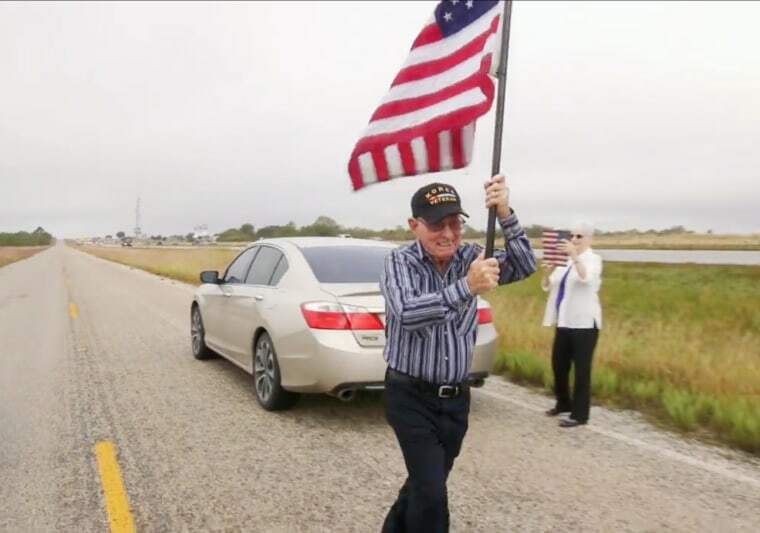 Roy Harris, who fought in the Korean War, spotted the Old Glory Relay occurring along a roadside in Texas last month and felt so moved, he took the flag for a run in his cowboy boots. "They saw my Purple Heart tags on my car and I also had my Purple Heart cap on and we were really just rejoicing literally right there," the 86-year-old said, recounting the experience this week with organizer Team Red, White & Blue. "He asked me if I would be a part of the relay team and carry the flag for a little way, and I told him i consider it kind of a blessing and a privilege," Harris added. The veteran had spent a year from 1952 to 1953 on top of a cold outpost in South Korea dodging bullets, earning his Purple Heart when his luck ran out and he was hit with shrapnel in his leg. The injury didn't keep him from the battlefield for too long though. "I had a hole through my leg and he went in both ways on it and kind of got me doctored up and they sent me right back out on top of the mountain again," Harris said. "I spent a year on top of that mountain. There were 24 of us on that mountain. And out of the 24, five of them came back in a body bag and I was one of the fortunate ones." The God-fearing man said that upon his return to Texas, he asked his high school sweetheart to marry him. Sixty-four years later, Paula Harris, his wife watched as her husband's eyes lit up when he saw the flag flowing in the winds of the Lone Star State and hop-skipped it down the road. "Oh, it was sheer excitement," she said. "It's just a delight and it not only happened that day but every time he hears the Pledge of Allegiance or sees that flag, he stands at attention. He's just dedicated, he's dedicated to our country." Team RWB has held the relay for the last four years with members taking their flag from coast to coast between 9/11 and 11/11 — this year, the relay started in Seattle and ended in Tampa, Florida, and was run and biked by 82 different teams of volunteers, the nonprofit group said. Donnie Starling, a RWB relay route organizer, said that one of the most important and rewarding parts of the relay is the outreach to children in school with talks about living a life of service and respecting the flag. "I guarantee you're going to smile, but when you turn the corner and 800 American kids are screaming USA at you — that's the Old Glory Relay," Starling said. "That is the moment that I try to get as many people as possible to feel because that's where, you know, the veteran is so proud of what they've done and they're being able to share and pass it on to the next generation."